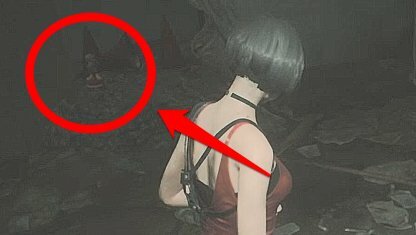 Check out all the Mr. Raccoon locations in Resident Evil 2! 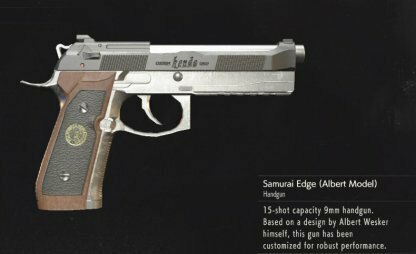 Find out where to find all the Mr. Raccoon Toys, and what to do with them to unlock the Infinite Knife. What Are Mr Raccoon Toys? 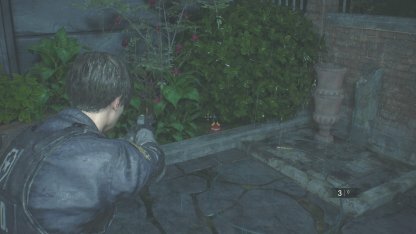 Finding and destroying all Mr. Raccoons is required to unlock the Infinite Combat Knife, which becomes helpful later on when tackling harder difficulties or aiming for S-Rank. 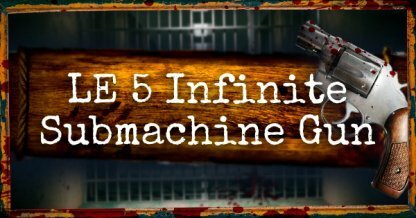 Check Out How to Unlock Infinite Knife Here! 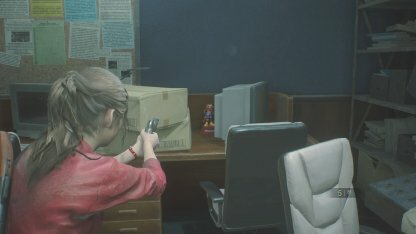 Detailed location of each Mr. Raccoon figurine can be found in the section below. 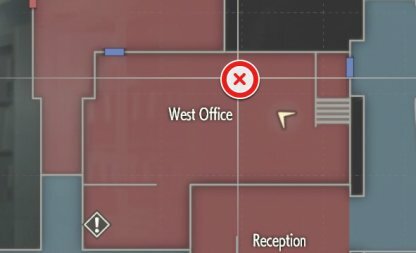 From the Main Hall, enter the West Office on the first floor. 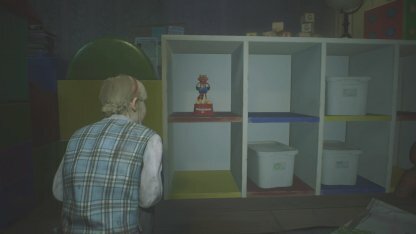 The Mr. Raccoon can be found on top of a Cabinet on the right side of the room. 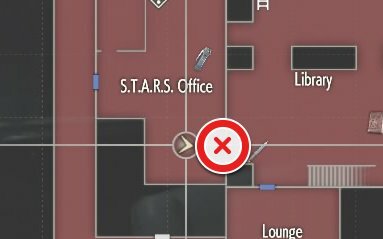 When entering the STARS Office via the Shower Room head to the rightmost side of the office. The Mr. Raccoon is between a stack of boxes and a computer monitor. 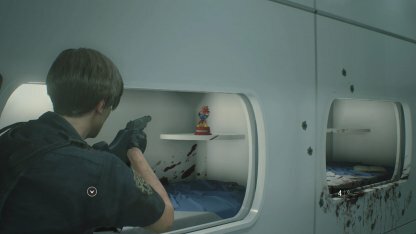 When using Leon, head into the other room connected to the Break Office, and check the Bunk Bed ahead of you. There will be a Mr. Raccoon dancing by the base of the bed, behind some duffel bags. 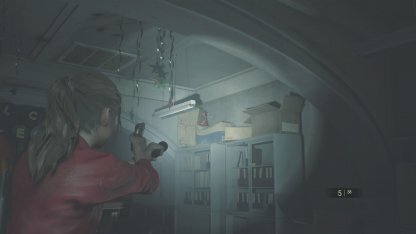 When using Claire, go to the East Hall 3rd floor via the Chief's Office. 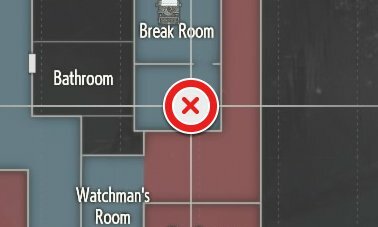 Unlock the door using the Diamond Key, and the Mr. Raccoon will be in front of you by the stairs. From the East Storage Room, head to the door that unlocks with the Heart Key. The Mr. Raccoon will be on top of the shelves immediately to your left. Can only be found by Claire. Explore the Clock Tower area and you will find a door opposite the entrance from the Main Hall. Enter this door, and continue following the path till the dead end. The Mr. Raccoon will be on the window to your left. 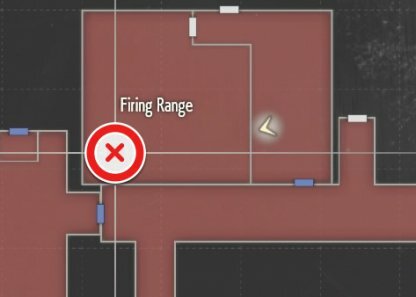 When entering the Firing Range, immediately face left and aim your gun. The Mr. Raccoon will be a found on the floor just below a fallen target board. After entering the bus, look to the front at the Bus' dashboard to find the Mr. Raccoon Toy. Can only be found by Claire. 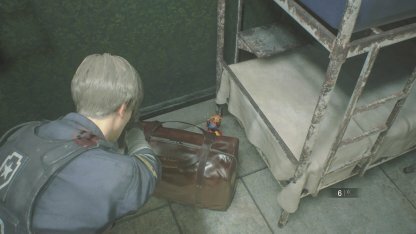 When entering the Nursery from the Main Lobby, the Mr. Raccoon can be found in one of the Square Drawers directly in front of you. 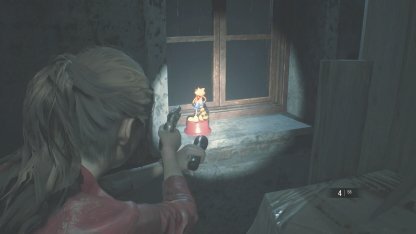 Can only be found by Claire when she rescues Sherry from the Orphanage. 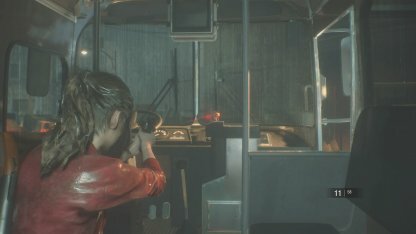 After the Giant Alligator encounter, Ada will drop a ladder down to you. Look in the opposite direction to find the Mr. Raccoon sitting on a ledge. 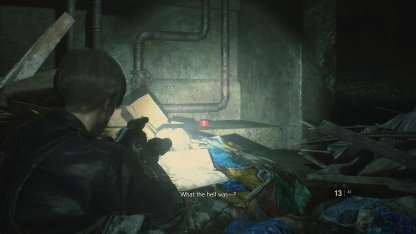 Can only be found by Leon. Make sure to get this as this area cannot be accessed later on. 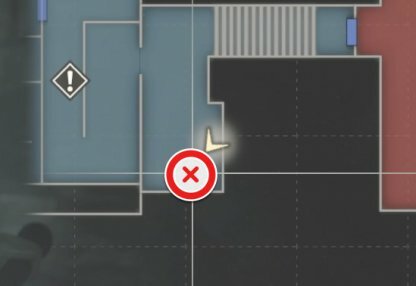 Check Out Points of No Return Guide Here! 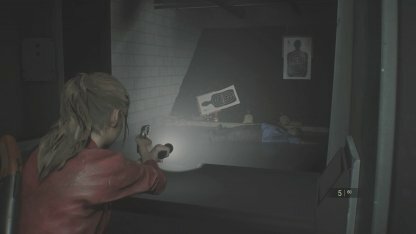 When playing as Ada, you will find the Mr. Raccoon on the right side of the Incinerator door. 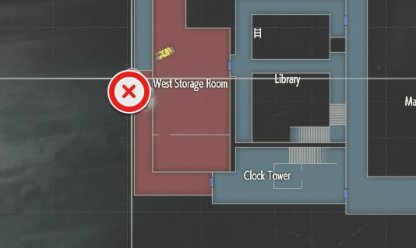 It is next to some cones on the corner of the map. 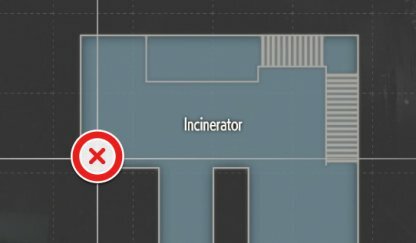 Make sure to get this before getting the ID bracelet inside the Incinerator. 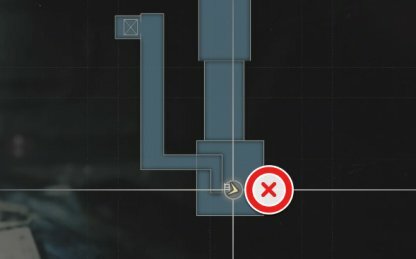 Before entering the Supplies Storage Room at the Bottom of the Sewers, head to your left. The Mr. Raccoon will be on the floor beside some boxes and a cart. 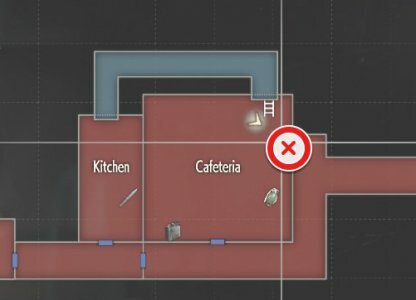 In the Laboratory, enter the Cafeteria, and make your way to the ladder. Before going up the ladder, take a look to your right to find the Mr. Raccoon on the table. 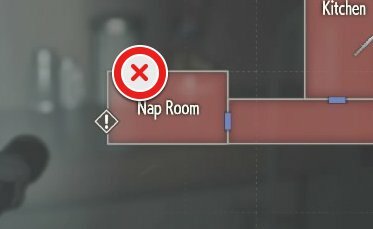 Once you have the Signal Modulator, head to the Nap Room. Adjust it to the signal "M-U-F" and use it on the terminal to turn on the power. 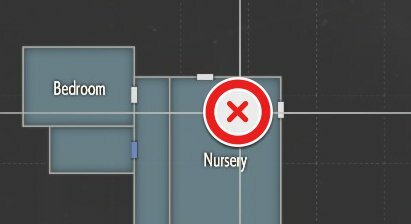 This will cause the beds to open. The Mr. Raccoon is on the bed nearest to your left. 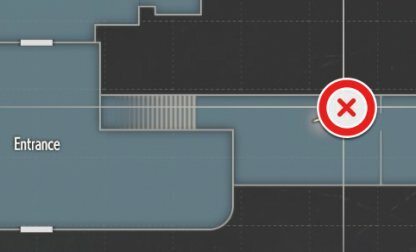 From your starting point in the 2nd run, go down and up the stairs in the middle of the map. 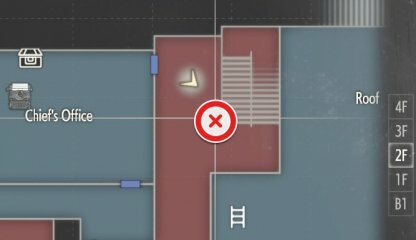 After going up the stairs, look to the floor on your left. There should be a Mr. Raccoon hiding behind some leaves. 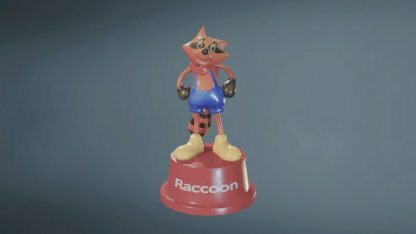 Mr. Raccoon Statues are colorful toys that can be found all around the map! Raccoon is orange with a blue shirt, yellow shoes, and is standing on a red platform. 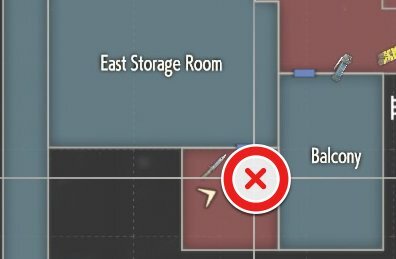 This color scheme helps you easily identify them while out exploring the map! Mr. Raccoons will also make a high-pitched buzzing noise, similar to a toy with small gears running when you are near them. Find them immediately and shoot them! 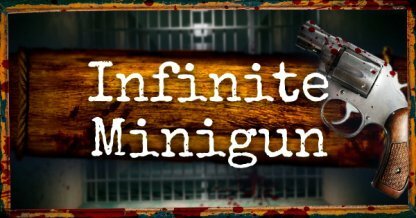 Shooting all of the Mr. Raccoon Toys will unlock the Infinite Knife for you to use! 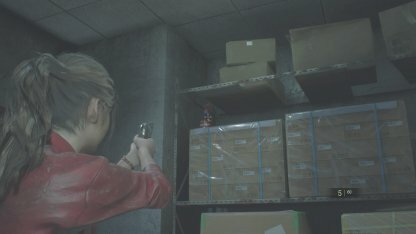 This Sub Weapon will never break, and can be used to help you get out of a grab from Zombies! 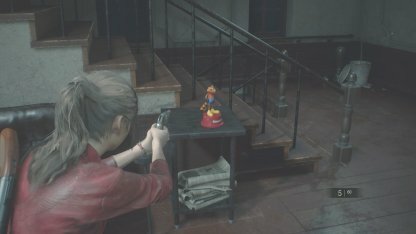 During your initial playthrough, you will only be able to find up to 14 Mr. Raccoons, and will need to play the 2nd playthrough in either Leon or Claire to find the 15th figure to complete the entire set. 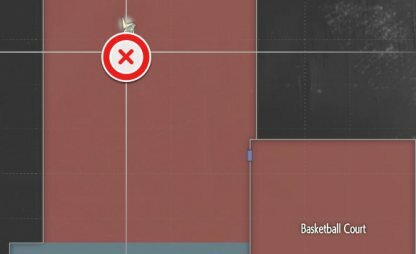 Mr. Raccoons that have been shot in a previous run will not appear in future runs that you do. It will be helpful to keep track of which Raccoons you have shot so you don't waste time tracking them down. Be sure to keep track of which Mr. Raccoon you have already destroyed! 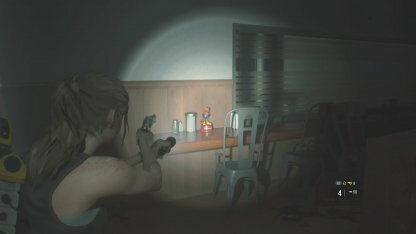 The numbers of Mr. Raccoon you have destroyed will not be tracked in-game. Once you destroy a Mr. Raccoon toy, memorize or note the location so you'll know which locations you need to visit next. 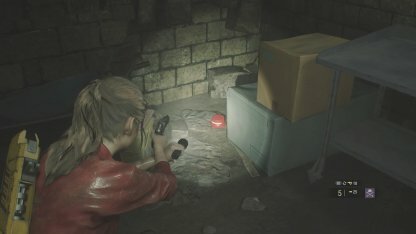 Make sure you have a save file for each major location to easily hunt them down.